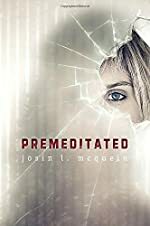 Premeditated by Josin L. McQuein. Review: Dinah's life seems to fall apart when her cousin, Claire is driven to slitting her wrists leaving her in a coma fighting for her life. In Premeditated by Josin L. McQueen shows readers just how far someone is willing to go because of love. Dinah is a high school student with one goal in mind. She wants to take down the boy who drove Claire to attempt suicide changing everything about herself, Dinah sheds the piercings, dark hair, and clothes in exchange for a private school girl, uniform, and blonde hair. Dinah's determined to infiltrate Claire's school, which is made possible because Dinah is staying with her aunt and uncle as she awaits Claire's recovery. As Dinah becomes one of "them", she finds everything is not always as it seems. Premeditated is a clever book incorporating unique well-developed characters. Dinah's friends from the past, as well as her new private school friends, come together to create a dynamic blending of personalities. Dinah's character in particular is witty, wise, and at the same time very self-conscious and sensitive. She refers to one girl as "Abigail-Not Abby" throughout the book as one example of her wry humor. The plot development is also strong, leading readers in unpredictable directions. Aside from a slow, unclear beginning, Premonition is a book that will ring home for many adolescent readers. However, without reading the book jacket, readers will spend the first portion of the book confused. As one who does not read the inside flap, it took quite a while to understand Dinah's motivation. The inside flap should really be the first page of the book. Other than that, the endearing characters and plot development will keep readers enticed to the very end. Review written by Margo Nauert. We would like to thank Random House for providing a copy of Premeditated for this review. Have you read Premeditated? How would you rate it?